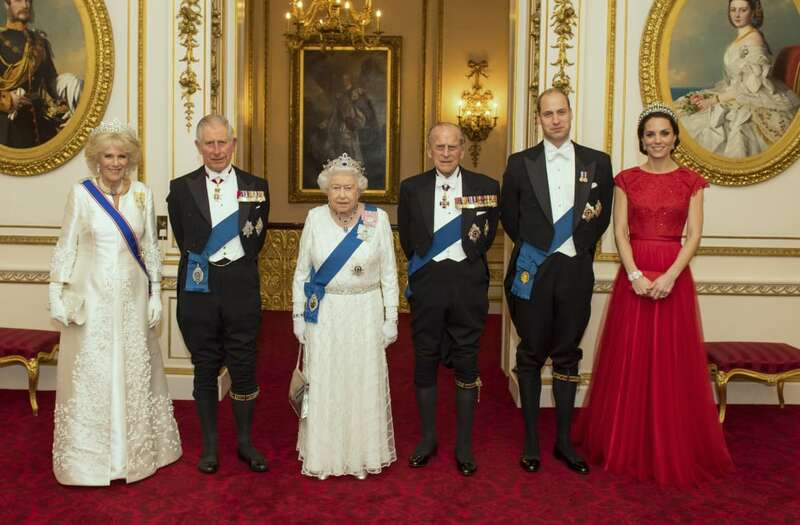 The epitome of elegance, the British royal family lives a life of opulence a commoner can barely fathom. Whether they were born in the spotlight or married into it, the well-heeled Brits have captivated the world for as long as anyone can remember. The Mountbatten-Windsor clan resides in palaces, has personal staffers at their beck and call and regularly jets off to exotic locales. But in many ways, they’re just like regular people. They have bills, like to decorate for the holidays and like to dine out every so often. Take a look at how they spend their money, and get a glimpse of the elite family’s financial state. Undeniably the most stylish member of the British royal family, the Duchess of Cambridge — more commonly known as Kate Middleton — is a global fashion icon. In addition to her enviable wardrobe, she also has a closet full of chic accessories. Some of her most expensive items include an $850 Mulberry Darley textured-leather shoulder bag — she reportedly owns several colors — and a $2,195 Cartier Pasha De Cartier watch, according to People magazine. Not one to shy away from more moderately priced accessories, some of her slightly more affordable pieces include a $145 Longchamp Le Pliage Tote and a pair of $168 Bvlgari Women’s BV8170 Sunglasses, according to the magazine. He put it up for auction in 2016, but Prince Phillip previously owned a 1954 Aston Martin Lagonda 3-Liter Drophead Coupe, one of the rarest cars in the world and worth as much as an estimated $640,000, according to Forbes. As a way to blend in with traffic, Queen Elizabeth’s husband also purchased an eco-friendly London taxi in 1999, which he donated to England's Sandringham Museum in 2017. Also a car enthusiast, Prince Charles owns a rare 1969 Aston Martin Volante DB6 MKII, according to People magazine. Driven by Prince William on his 2011 wedding day, the Hagerty Insurance valuation tool estimates a similar car in mint condition at $497,000. A public education won’t cut it for members of the British royal family. Prince George, the 4-year-old son of Prince William and Catherine, the Duchess of Cambridge, started attending Thomas’s Battersea School in London in September 2017. Tuition and fees total $7,809 in U.S. dollars per term for students aged 4 to 7, and there are three terms per calendar year. The price decreases in price for each subsequent child enrolled concurrently per family, should his sibling — Princess Charlotte — one day join him at the school. This isn’t Prince George’s first school. He previously attended nursery school at Westacre Montessori School in East Walton, in Norfolk, England, near Anmer Hall, the family’s country home. When he started school in January 2016, tuition cost $55 per day, according to People magazine. Members of the British royal family maintain busy schedules filled with official duties and charitable activities. In 2016, Prince Charles and his wife, Camilla Parker Bowles — also known as the Duchess of Cornwall — joined Prince William and his wife, and Prince Harry to rack up a combined tab of about $14 million, according to the official website of Prince Charles. Most expenses related to official and charitable duties are paid for by Prince Charles’ private income from The Duchy of Cornwall. Revenues from the private estate, which was founded in 1337, are passed to Charles, who is the current HRH Prince of Wales and Duke of Cornwall. Prince Harry and Meghan Markle reportedly began dating in May 2016, and he enjoys showering her with lavish gifts. Some of these include a Cartier Love Bracelet — valued at roughly $6,650 — and a gold Maya Brenner necklace not-so-subtly adorned with the letters ‘M’ and ‘H’, which retails for roughly $300. Shortly before news of their relationship went public in October 2016, the prince reportedly spent thousands on a piece of art titled “Everybody Needs Somebody to Love,” by British artist Van Donna, ‘for an important person,’ according to People magazine. And in June 2017, the Daily Star reported the royal was planning to buy Markle an approximately $41,000 Mini Cooper for her birthday. When it comes to childbirth, Kate Middleton spares no expense. Prince William’s wife has given birth to both of their children — Prince George and Princess Charlotte — in the exclusive Lindo Wing at St. Mary’s Hospital in London’s Paddington section. Both Prince William and Prince Harry were also born in the hospital, where suites ran $9,650 per night in 2015 when Princess Charlotte was born, according to US Weekly. After the first stay, mothers reportedly receive a 10 percent discount, which will come in handy if the currently pregnant Middleton decides to have their third child in the same place. Kensington Palace announced her pregnancy on Sept. 4, 2017. Maintaining the royal residences isn’t cheap. For the fiscal year ended March 31, 2017, Queen Elizabeth spent nearly $24 million on property maintenance, almost $4.1 million on utilities, and $2.9 million on housekeeping and hospitality, according to the Sovereign Grant and Sovereign Grant Reserve financial summary published on the British royal family’s official website. Established in 2012, the Sovereign Grant is issued to the queen annually in exchange for the revenue from the Crown Estate, a real estate portfolio long owned by the reigning monarch. Initially set at 15 percent of the Crown Estate revenue, the grant was increased to 25 percent of profits in 2016 for a 10-year period to cover Buckingham Palace upgrades. You can’t be queen without a staff. For the fiscal year ended March 31, 2017, Queen Elizabeth’s payroll expenses totaled nearly $27 million, on top of other staff costs of $1.9 million, according to the Sovereign Grant and Sovereign Grant Reserve financial summary. Doing one’s own grocery shopping, cleaning and laundry is decidedly unroyal, so Prince William and Kate have a little help. It’s unknown who’s currently assisting the family, but in May 2017, The Sun reported their housekeeper had recently quit her roughly $46,500-per-year job because it was too demanding. Even the British royal family likes to go out to eat. In September 2016, Prince Charles, Camilla Parker Bowles and her son and daughter-in-law were spotted at Scott’s Restaurant in London’s Mayfair neighborhood, according to People magazine. It’s unknown what they ordered at the seafood restaurant, but the eatery serves up deep-fried haddock for approximately $26.50 and a fillet of wild seabass for around $53. In February 2017, Prince Harry and Meghan Markle were spotted heading to dinner at Soho House, a private members’ only club in West London, according to The Sun. The restaurant menu includes a $21 cheeseburger and a $39 cumbrian rib of beef. Prince Harry isn’t content to let staff do all the holiday decorating for his Nottingham Cottage home. In December 2016, the royal was spotted buying an approximately $86 Nordmann Fir Christmas tree from Pines and Needles in South London’s Battersea Park with Meghan Markle. The Daily Mail reported the prince paid for the tree with a credit card. Markle reportedly happily accepted a bunch of mistletoe with their purchase, while the prince wasn’t as keen on it. Seemingly in the holiday spirit, staffers told the publication the happy, low-key couple was friendly and largely slipped under the radar.